The spider is widespread in England and Wales as far north as West Lancashire and North-east Yorkshire, but is absent further north apart from one record for south-west Scotland (McCleary 1998). The species is widespread in western Europe as far north as Scandinavia, but only one old record is mapped at the southern tip of Norway (Aakra & Hauge 2000) and the species is apparently absent from Finland. 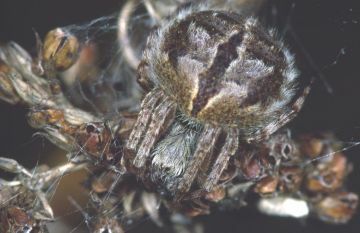 The species is found in heather and gorse, usually below one metre above the ground, and rough grassland where the spider often makes its web between dead herbaceous stems with a retreat in a dead flower-head. In the north of England the spider is most common on sand dunes, often on creeping willow (J. Newton, pers. comm.). The hub of the medium sized orb web is often covered with fine silk. The spider's abdominal markings show considerable variability (see Jones (1983)). After over-wintering as a sub-adult, adults can be found from late spring to mid-summer. Local, but the species may be numerous in suitable habitat in the south. It is rare and mostly coastal in north-west England.